"When humankind was young, we lived in a garden paradise. I believe that to be literally true; it is also experiencially true for the fortunate among us. When we were children, we lived in a protected sanctuary, under the loving care of our parents. The world was new to our experience, and filled with wonder and mystery. The light had a special radiance...the flowers were treasures of color and scent...a butterfly was a small miracle. And then we grew up. "Pathway to Paradise, which follows my Stairway to Paradise, continues on a spiritual and artistic journey toward a vision of the sublime. As we stride up the crumbling stone steps we find ourselves wandering a pathway that winds through simple wonders of nature; lavish, rainbow-hued blossoms, that affirm the promise of God's love. I like to think of myself as a fellow discoverer on the Pathway to Paradise...one of the fortunate few who have been granted a vision of peaceful perfection. I invite you to travel this glorious road with me." Purchase unframed and save $75.00. Fax - Fax us at 1-919-484-0114 to place an order by facsimile. 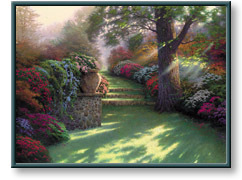 Pathway to Paradise copyright © 2002 by Thomas Kinkade is prohibited from being copied. Web pages copyright © 1998-2002 by Christ-Centered Mall, Inc. All Rights Reserved.